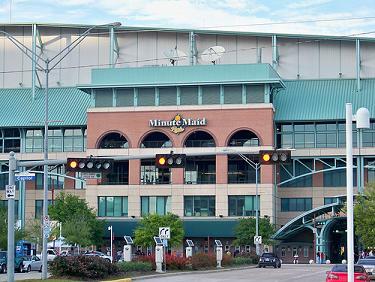 Minute Maid Park, nicknamed “The Juice Box”, is the home of the Houston Astros. It is located in downtown Houston, next to the former Union Station. Other names for the ballpark include The Ballpark at Union Station, Enron Field, and Astros Field. It replaced the Houston Astrodome. To protect the Houston Astros players and baseball fans from Houston’s extreme hot and humid weather, the Astros built the first retractable roofed ballpark in Houston, Texas. The ballpark features grass instead of artificial AstroTurf used by the Astrodome. The large entrance way of The Juice Box is inside the former Houston Union Station. The left side of the field has a train to pay homage to the site’s history. When the Houston Astros win a game or when a Houston Astros player hits a home run, the train moves along a track the length of the exterior wall beyond left field. 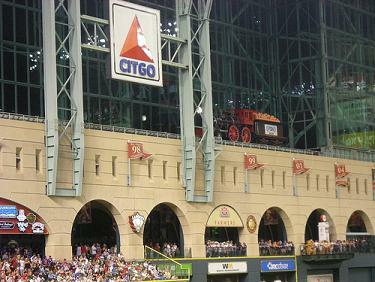 The train’s boxcar, traditionally used to carry coal, carries oranges instead to pay respect to Minute Maid. While the previous home of the Astros, the Astrodome, was the most pitching-oriented stadium in Major League Baseball, Minute Maid Park is more hitter-friendly, particularly down the lines. As a fun challenge to hitters, the Astros CEO Drayton McLane hangs a sign below his office windows, located in the old Union Station, marked 422 ft from home plate. Fielding is a challenge in center field where there is a 90-foot wide, 30 degree incline known as Tal's Hill, named for team president Tal Smith. This hill has caused some of the most replayed catches in recent baseball history, and plenty of controversy as well. In left-center field above Tal’s Hill a concourse features the "Conoco Home Run Porch" that actually hangs over the field of play. There is also a classic gasoline pump that displays the total number of Astros home runs hit since the park opened. In 1996, fourteen Houston-based companies joined forces to form the "Houston Sports Facility Partnership." The purpose of the partnership was to build a stadium in downtown Houston. 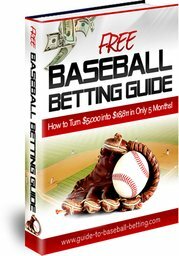 The Partnership agreed to provide an interest-free $35 million loan with no repayment until the ballpark has operated for 10 years. With the support of the Partnership, the Harris County-Houston Sports Authority presented a ballpark proposal to the public in November 1996. Voters approved the $250 million project. The first name of the ballpark was Enron Field after Enron purchased the naming rights to the ballpark on April 9, 1999 for $100 million over a 30-year period. When Enron went bankrupt, Houston Astros management had to deal with one of the biggest scandals in history. Houston Astros management eventually bought back Enron's naming rights in 2001 for $2.1 million. 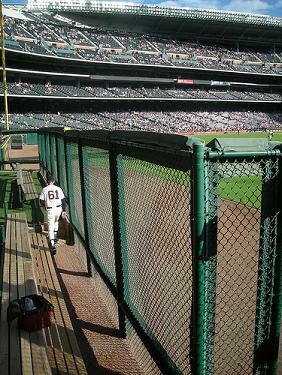 After the Enron corporate scandal, fans refused to call the ballpark Enron Field. Thus, the Astros renamed the ballpark Astros Field on February 7th, 2002. 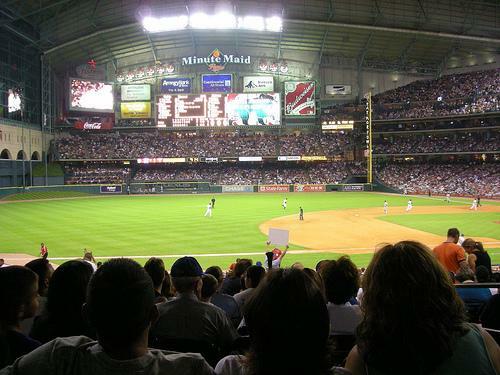 On June 5, 2002, Minute Maid and the Astros announced they expanded their business relationship to include a 28-year, $170 million naming rights deal. So for the second time in four months and the third time in three years, the Astros renamed the ballpark Minute Maid Park. In July 2004, the ballpark held the 2004 MLB All-Star Game, won by the American League 9-4. On October 9, 2005, The Juice Box hosted the longest postseason game in Major League Baseball history. The Astros defeated the Atlanta Braves 7–6 in a game lasting eighteen innings, which took 5 hours and 50 minutes to play. On October 25, 2005, Minute Maid Park hosted the first World Series game ever played in Texas, and the longest World Series game ever played. The Houston Astros lost to the eventual World Series champion Chicago White Sox 7–5 in 14 innings, which lasted 5 hours and 41 minutes.